When we first decided to create an edition of Beer52 about Korea, it wasn’t originally part of our plan to visit the North. In all honesty, we weren’t sure if that would be possible, safe or indeed an advisable thing to do. The Democratic People’s Republic of Korea (DPRK), is certainly a subject of great controversy, criticism and intrigue around the world. We’ve all read horrifying stories about things that have happened there and the generations of suffering the North Korean people have endured. Over the past twelve months, the sensitive situation on the Korean peninsula has frequently been front page news. From the frightening to the ludicrous, reports surrounding the ‘Hermit Kingdom’ have hardly endeared it to potential tourists. Needless to say, when we first floated the idea of going there, our mothers thought we’d lost our minds. Aside from the potential to put our personal liberty in peril, we also wondered whether visiting there would somehow be seen as endorsement of the North Korean regime. We questioned whether any money we spent there as visitors would end up being used to support things we’d find disagreeable. All in all, the decision to go there wasn’t taken lightly and we relied in particular on the opinions of our friends in South Korea. Having visited Seoul more than a dozen times over the past six years of doing business there, many of my best friends are Koreans. I’ve become fascinated by their unique and warm culture and learned first-hand how strong their hopes for reunification are. We decided we would bring South Korea’s craft brewers together to collaborate on a beer recipe dedicated to their shared dream of Korean reunification. We would first go to North Korea to meet with brewers there, learn about the history of beer-making and the ingredients they use, and ultimately select an ingredient to represent North and another to represent South. The label would be designed in Korea and profits from the sale of this beer would be given to a relevant NGO, to benefit people in the North. Despite the politics and controversy surrounding North Korea, we reasoned having a unique opportunity to explore our shared passion for beer with ordinary North Korean brewers would be a special experience for all. 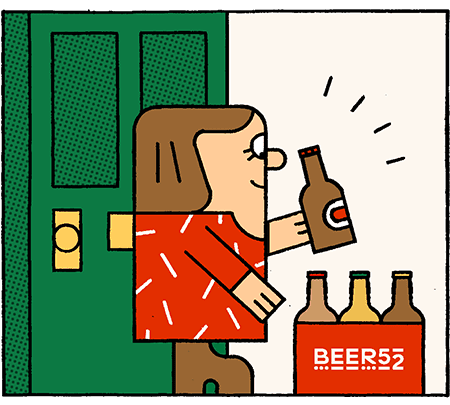 Without wanting to resort to cliché, it’s true that having a beer together and trying to understand one another’s perspectives is a powerful thing. Traveling to North Korea, perhaps making friends with people there and sharing stories about each other’s lives, could only be a good thing, however small. Nowhere in the world is there a nation of people divided in the way they are here. After 38 years of Japanese colonisation and upon the end of World War II, a line was drawn along the 38th parallel. The northern part of the country was occupied by the Soviet Union, the south by America. Both governments believed themselves to be the legitimate administration of the entire peninsula and viewed this border as temporary. Having been a leader of guerrillas fighting against Japan’s imperial forces, Kim Il Sung became leader of the communist North and in 1950, after a number of skirmishes, invaded the South, with a view to ‘liberating’ it from capitalism and the United States. The Korean war raged for three years, costing between three and four million lives, most of them civilian. This damage was most acute in the North, which endured heavy bombing by the United States, including extensive use of napalm. It is believed a quarter of the pre-war population perished. In 1953, an armistice was signed, fighting ceased and the ‘De-Militarized Zone’ (DMZ) was created, which, despite its name, is in fact the most militarised place on Earth. The border became indelibly fixed, a peace treaty was never signed and technically a state of war has continued for the seven decades that have followed. This border not only continued to divide the country, but also hundreds of thousands of ordinary Korean families, including that of South Korean president Moon Jae-In. Millions of Koreans on both sides have distant relatives they are simply unable to reach. They are not allowed to travel, to write or even to find out if one another are still alive. The desire to one day cross the border and meet their counterparts at the other side is a dream that all Koreans hold dear. Perhaps the most heart-breaking thing about the Korean situation is that it is a conflict between two ideologies, under which the people have nothing but love for one another – they are one big Korean family after all. And so, when we talked about North Korea with our friends in the South, they urged us to go there. They wanted us to experience something they can only dream of and encouraged us to do what we could to form friendships, however temporary that might prove to be, with the people we would meet. And so, Erik from Magpie joined us as we travelled to the North, spent a week there and searched for inspiration for a beer. On our return to South Korea, we met up with Jinsu Lee and Namkyung Lee from The Booth, Changmin Lee and Junpyo Lee from Wild Waves and Kwan Kim from Amazing. Our head brewer and master collaborator, Chris J.J. Heaney came along to help facilitate the conversation and ultimately craft the recipes for the beers in partnership with the participants. Our base for the day would be the Hotel Cappuccino in Seoul’s world-famous Gangnam district. Home to luxury stores, fancy bars, tiny dogs and gigantic malls, it is the dynamic, beating heart of the southern side of the city. Tasting beers from previous Beer52 boxes as well as recent creations from each of the participating brewers, we have a great discussion about how best to represent the Korean craft beer scene through our set of beers for this issue. Erik took the opportunity to share a slideshow of photos from our trip to North Korea and answered questions from the other brewers, who were all fascinated to learn more about the breweries and people across the border. Discussing what kind of ingredients are typical of Korea, the group throws up things like ginseng, omija berries, green tangerines, Sancho peppercorns, green tea and buckwheat, used to make the iconic North Korean ice noodle dish. Each of the brewers decides to take inspiration from at least one typically Korean ingredient for their own beer recipes and we agree to use two of the most famous – ginseng and Sancho peppercorns – for the collaboration beer. Ginseng would represent the north of Korea, while Sancho peppercorns would represent the south. 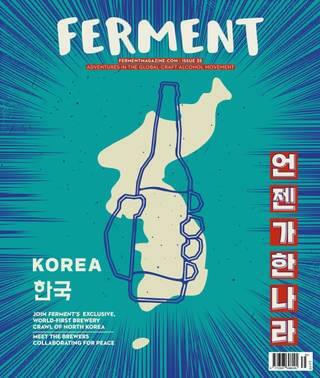 When it comes to naming the beer, we have a discussion about whether we should call it a ‘peace beer’, since it represents peace and unity of the Korean peninsula. However, the group decides that this wouldn’t be the right name; war, not peace, is the status quo. The hope is that peace and reunification will happen ‘one day’ and so the name ‘One Day, One Korea’ is agreed and the recipe finalised. To celebrate a successful day of sharing ideas and beers, we head out into Seoul and visit a number of the brewers’ favourite spots.